Investigators injected transgenic Alzheimer's disease mice with tissue from human cadaveric pituitary growth hormone and found that the amyloid-beta deposits were able to infect, “seed,” and lay down clumps of amyloid-beta. The finding suggest that these decades-old samples can transmit one of the pathological hallmarks of Alzheimer's disease. Some human cadaveric pituitary growth hormone (c-hGH) samples used from the 1950s through the mid-1980s to treat children with short stature were contaminated with prion protein, which decades later resulted in Creutzfeldt–Jakob disease (CJD). On autopsy, scientists also found amyloid-beta protein (Abeta) deposits in the blood vessels and in between neurons, hints of a pathology that could have ultimately led to Alzheimer's disease (AD). Now, three years after their first report of the Abeta deposits, scientists at the MRC Prion Unit of University College London in collaboration with scientists at Brigham & Women's Hospital and Harvard Medical School, collected c-hGH samples stored since 1985 (when companies substituted synthetic pituitary growth hormone) and found that the Abeta deposits were able to infect, “seed,” and lay down clumps of Abeta in transgenic AD animal models. The findings, published December 13 in Nature, suggest that these decades-old samples can transmit one of the pathological hallmarks of AD. While human-derived pituitary growth hormone is no longer used, the finding raises concern that Abeta material can still set in motion an active toxic state, and the possibility that microscopic Abeta deposits may be resistant to normal cleansing of surgical tools in the neurosurgery suite and could ultimately pose a risk for people undergoing brain surgery. Rare cases of prion infectivity have been linked to medical or surgical procedures. More than 200 individuals treated with c-hGH worldwide have died of iatrogenic CJD, according to John Collinge, MD, professor of neurology and head of the MRC Prion Unit and senior author of the new study. Dr. Collinge and his team have been involved with a long-term prospective study of prion disease. The findings from the groups' initial 2015 paper in Nature led them to the idea that the stored batches of c-hGH may provide insights into why Abeta was found in the blood vessels and in parts of the brain tissue in people who underwent hormone treatment in childhood and died of prion disease decades later. Public Health England had archived vials of c-hGH, and the scientists were able to obtain samples of some of the material linked back to the eight patients in their earlier study who had died of prion disease. The small amounts of dried powder had been sitting in vials on shelves for more than 30 years. The 2015 Nature paper reported that the scientists had identified Abeta pathology in the brain tissue and cerebral blood vessels of seven of eight CJD patients tested. There were several manufacturing procedures used at the time, and only one of them, Hartree-modified Wilhelmi procedure (HWP), has been linked to contaminated material that led to prion disease. Dr. Collinge said that every CJD patient received at least one injection of this hormone preparation as a child. Now, as reported in the current study, the scientists were able to identify the vials used during the treatments and to distinguish those that were manufactured with other procedures. The material was sent to Dominic M. Walsh, PhD, associate professor at Brigham & Women's Hospital and Harvard Medical School. Dr. Walsh and his team were blinded to the preparations in the vials. They analyzed the vials for the presence of Abeta peptides (Abeta1–40 and Abeta1–42) and tau proteins. All of the HWP vials tested were positive for Abeta1–40 and tau, and all but one was also positive for Abeta1–42, said Dr. Collinge. They could not detect Abeta peptides or tau in hormone vials manufactured with other preparation methods. They found that the stored c-hGH material (processed with the HWP technique) seeded and spread Abeta pathology. Abeta seeding did not take place in animals who received the hormone prepared with other non-HWP techniques. They also injected the decades-old material into wild-type mice that express only murine APP and saw no amyloid deposition, just as they had expected. “I was amazed that we could seed the material,” said Dr. Collinge. The scientists said they are now conducting studies to see whether the tau identified in the c-hGH vials can seed aggregation in transgenic mice expressing human tau protein. There has also been no evidence of iatrogenic spread of AD, although the evidence from this study suggests that those patients with evidence of Abeta pathology might have ultimately developed clinical signs of Alzheimer's had they lived longer. Some of the patients with amyloid aggregation in their cerebral blood vessels had enough pathology to meet a diagnosis of CAA. The Abeta pathology did not meet the full pathological criteria of Alzheimer's disease, according to Dr. Collinge. “This material may have been contaminated with Abeta seeds and prions,” he added. “Although we reiterate that there is no suggestion that Alzheimer's disease is contagious, and no supportive evidence from epidemiological studies that it is transmissible (notably by blood transfusion), we consider it important to evaluate the risks of iatrogenic transmission of CAA, and potentially of Alzheimer's disease,” the scientists wrote in the paper. “The Alzheimer transmissibility risk used to be believed to be zero but there is evidence from our work and others that while AD is far less transmissible than CJD, AD transmission potential may be greater than zero,” Dr. Gandy pointed out. There has also been concern about CJD contamination of the blood supply. Dr. Gandy cited research by a team of scientists in Germany, France, and Spain that characterized the presence and distribution of CJD agents (sporadic and variant forms) in the blood. They quantified the levels of infectivity associated with different blood fractions from CJD affected patients. The blood cells (white and red blood cells) and the plasma from a variant CJD affected patient contained infectivity, he said. Regarding sporadic CJD, infectivity was detected in the plasma of two out of the four investigated cases. There are no blood tests to identify misfolded brain proteins associated with Alzheimer's, Parkinson's. and prion disease, Dr. Gandy noted. But he added that federal scientists at the Rocky Mountain Laboratories in Montana, part of the National Institutes of Health, are testing ultrasensitive RT-QuIC seed amplification assays for disease-associated tau, alpha-synuclein, and prion aggregates in cerebrospinal fluid. “They recently described a tau RT-QuIC prototype to diagnosis and confirmation of Pick's disease (with predominant 3R tau pathology) in postmortem CSF samples,” Dr. Gandy said. Drs. Collinge and Gandy reported no relevant disclosures. Dr. Holtzman has served on the scientific advisory board or consulted for Genentech, Eli Lilly, and AbbVie. •. Purro SA, Farrow MA, Linehan J, et al Transmission of amyloid- β protein pathology from cadaveric pituitary growth hormone https://www.nature.com/articles/s41586-018-0790-y. Nature 2018;415–419. •. Jaunmuktane Z, Mead S, Ellis M, et al Evidence for human transmission of amyloid-β pathology and cerebral amyloid angiopathy https://www.nature.com/articles/nature15369. Nature 2015;525(7568):247–250. 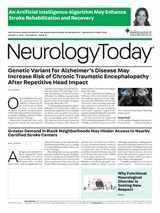 Neurology Today19(3):1,28-32, February 7, 2019.